Nissan promised that the Leaf's starting price would be about the same as a comparably equipped diesel or hybrid vehicle in Europe. The European starting price for the Nissan Leaf full-electric car will be less than 30,000 euros ($36,976) after incentives, the Japanese automaker announced Monday. The Leaf is arguably the most daring car in Nissan's history. Along with French alliance partner Renault SA, Nissan Motor Co. has invested more than 4 billion euros in electric vehicles, the company said in a statement Monday. Renault-Nissan CEO Carlos Ghosn is counting on electric cars to propel the French-Japanese alliance partners past Toyota Motor Corp. as the world leader in environmentally friendly cars. Nissan started taking reservations for the electric car in the United States in late April and expects to have 25,000 Leafs pre-sold by December, when the car will be in selected U.S. showrooms at a starting price of $32,780 before a $7,500 federal tax credit. Renault-Nissan aims to launch eight EVs under the Nissan, Renault and Infiniti brands, the company said Monday. Since announcing the Leaf, Nissan has promised that the car's starting price would be about the same as a comparably equipped diesel or hybrid vehicle in Europe. The base price for the Toyota Prius in Germany is 25,450 euros and rises to 28,750 euros for the top-of-the-line version of Europe's top-selling gasoline-electric hybrid. By comparison, Mitsubishi Motor Corp. has said its starting price for the i-MiEV, which is much small than the Leaf, will be 48,000 euros in Germany. ROLLE, Switzerland (May 17, 2010) -- Nissan International SA today announced that the all-electric Nissan LEAF will be priced at under 30,000 Euros (25,641 Pounds) after incentives in most of its European launch markets - about the same as a comparably-equipped diesel or hybrid vehicle. The company also announced specific prices for the UK, Netherlands, Republic of Ireland and Portugal, the four initial European launch markets for the Nissan LEAF. Reservations will begin in July. The Nissan LEAF is a compact, zero-emission five-passenger family car that comes fully equipped with features such as air conditioning, satellite navigation, a parking camera, a quick charge socket and innovative smart-phone connectivity. "Nissan leads the industry by being the first automaker to offer an affordable zero-emission car. It's a pure electric vehicle, with no tailpipe emissions and very low running costs. Nissan LEAF may look similar to a compact family car, but its smoothness, acceleration and handling will surprise and impress drivers and passengers alike," said Simon Thomas, Senior Vice President, Sales and Marketing, Nissan International SA. In the United Kingdom, the purchase price of the Nissan LEAF would be 23,350 pounds (27,471 euros) after government incentives. The price, which includes the battery, is 28,350 pounds (33,353 euros) before incentives. The UK government recently announced that it will refund 25 percent of the purchase price of a pure electric vehicle, up to a limit of 5,000 pounds. 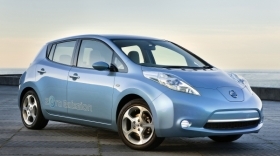 The Nissan LEAF goes on sale in the UK in February 2011. An array of other incentives can further defray the costs and increase the benefits of owning the Nissan LEAF. In the UK, EV customers benefit from advantages including zero vehicle excise duty and zero company car tax for five years. This, combined with significant savings in fuel costs of about 600 euros (513 pounds) on average annually in Europe versus a traditional car, makes the Nissan LEAF an affordable and compelling proposition. The purchase price in the Netherlands will be 32,839 euros (28,068 pounds). Here, subsidies will take the form of zero vehicle registration and road taxes, resulting in tax savings of 6,000 euros for private car owners and 19,000 euros for company car owners over five years. Sales in the Netherlands begin this December. The price in the Republic of Ireland is 29,995 euros (25,637 pounds) after 5,000 euros in government incentives. Buyers will be exempt from vehicle registration tax, which can amount to as much as 3,800 euros on a C-segment car. Sales in Ireland begin in February next year. The price in Portugal is 29,955 euros (25,603 pounds) after 5,000 Euros in government incentives. Portuguese customers owning the Nissan LEAF benefit from road tax exemption. Sales in Portugal begin this December. Nissan has decided to launch in these countries first due to significant government incentives for electric cars, and the ongoing development of charging infrastructure for their successful adoption. By the end of next year, Nissan LEAF will be available in every major Western European country. "The Renault-Nissan Alliance is investing over four billion Euros to lead the auto industry in electric vehicles, with eight products across three brands," said Simon Thomas. "This investment includes five battery plants and seven confirmed assembly plants, including Sunderland in the UK. This reflects the strong commitment the alliance has made to electric vehicles and our determination to lead the market." In addition to purchasing the car outright, customers will also be able to buy the car on a Nissan finance plan. Details of the all-inclusive acquisition method will also be released in July. Note: Amounts in euros and pounds are translated for the convenience of the reader at the foreign exchange rate of 1.17 euro/pound and 0.85 pound/euro (as of May 14, 2010).